Country music superstars Alan Jackson and Merle Haggard, as well as bluegrass icons Dr. Ralph Stanley and Ricky Skaggs, were among the 130 acts over four days in late April who performed at MerleFest 2014. As has been the case for the past 26 years, DiGiCo consoles processed much of the music coming from the Wilkesboro, NC festival’s 13 stages. MerleFest was founded in 1988 in memory of Eddy Merle Watson, son of bluegrass legend Doc Watson, as a fundraiser for Wilkes Community College and to celebrate "traditional plus" music, a term coined by Doc Watson to describe the wide variety of musical genres and styles celebrated at MerleFest. Since the festival's beginnings, Greensboro-based SE Systems has been handling sound for MerleFest. SE Systems CEO and Founder Cliff Miller was working with Doc Watson at the time and helped put the audio production in place for the first MerleFest, which was mounted on the back of a flatbed. DiGiCo consoles, according to SE Systems Media Relations Director Bryan Smith, are well suited for country music and bluegrass. "Acoustic instruments come across in a very natural way," he says. "When you put acoustic instruments in front of a mic, you don't want the preamps, effects or processing to change the sound. Cliff carried the DiGiCo SD10s on tour with Alison Krauss and we currently have two out with her now." 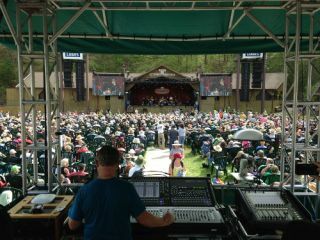 On the main Doc & Merle Watson Theatre stage this year, two DiGiCo SD10-36 consoles were used for mains and monitors. The adjacent Cabin stage, which was used for smaller acts while the primary stage was reset, featured a compact SD11 to mix mains and monitors and was positioned next to the primary stage SD10 FOH desk. The Creekside stage used two SD10-24s for mains and monitors, while the Dance stage used two SD9s for mains and monitors.